Say it’s time to move on to seek another plan after voters failed to support $46.6 million new school. From left, Tisbury selectmen Melinda Loberg, Tristan Israel and James Rogers shown at Monday's meeting. On Thursday, they voted to stop the project. The Tisbury board of selectmen pulled the plug on the $46.6 million Tisbury School project. The town sent two letters to the Massachusetts School Building Authority (MSBA) Tuesday to let the state agency know what the town intended to do after voters rejected a Proposition 2½ debt exclusion to pay for the town’s share of the project by 21 votes. A letter signed by Superintendent Matt D’Andrea, school committee chairman Amy Houghton, and selectmen chairman Tristan Israel pegged the reason for the failed vote to the cost of the project. But on Tuesday, minutes before the town had to send its response to the MSBA, the board of selectmen voted to send a second letter that added concerns about the town bulldozing an old school building as a deciding factor in the failed vote. “One point of clarification concerning the failed vote is that voters and the public in general struggled not only with the high cost of the project, but with the proposed demolition of the existing school,” the letter from selectmen states. It was the latest twist in what’s been a wildly divisive issue. A couple of school advocates were in the audience at Katharine Cornell Theater, and at times they shouted back and forth with Israel over the decision to send the letter, calling it the board’s opinion. “I’m not going to be pigeonholed,” Israel responded. “It was a phone conversation, so I did not,” Israel said. “The answer’s no, you didn’t give them enough respect,” Packer said. The options for the town were to seek a revote, ask for extension to make the decision (which was not guaranteed), or pull the plug. In a 3-0 vote Thursday that took a little more than 10 minutes of discussion, selectmen decided the voters had spoken at the ballot box. Their vote was in direct contradiction to a 14-2 vote Monday by the building committee to seek an extension of time. 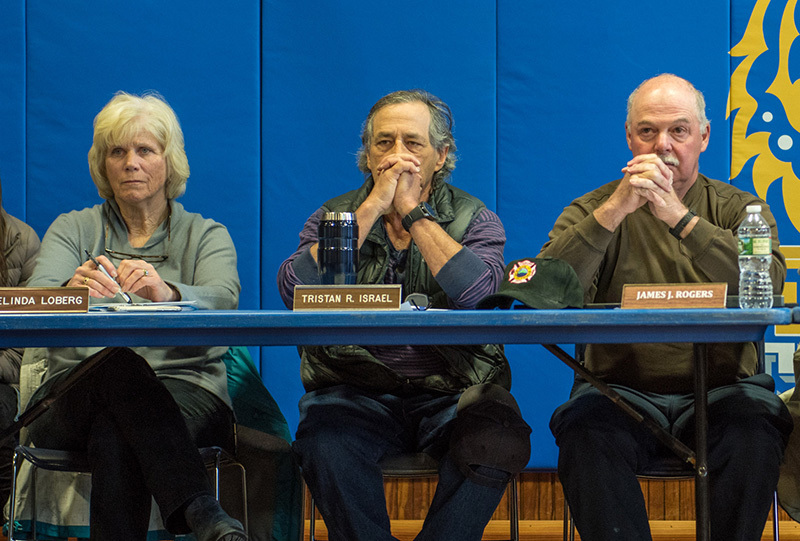 But the no votes were telling at Monday’s meeting, where selectman Melinda Loberg and town administrator Jay Grande were the lone dissenters. “This gives us no pleasure,” Loberg said just before Thursday’s vote. Colleen McAndrews, chairman of the Tisbury School building committee, said afterward the board of selectmen didn’t follow the proper process. They should have voted not to sign the letter approved by the building committee. “I’m frustrated and embarrassed,” McAndrews said. She said it was disrespectful not to allow her to explain the process and not to allow Superintendent Matt D’Andrea to read the letter before taking the vote. The letter to the MSBA requires three signatures — the superintendent, the school committee chairman, and the board of selectmen chairman, McAndrews said. The letter will still be sent, with an explanation that the selectmen refused to sign, she said. “I’m embarrassed that’s how our leadership handled it,” McAndrews said. About two dozen people, including D’Andrea and McAndrews, were in the audience Thursday afternoon when the vote by selectmen was taken. One person sought to speak, and was told by Loberg, the board’s acting chairman, that there would be no comments from the audience. All of the selectmen made brief comments. The offer was made at no additional expense to the town, which has already spent $825,000 on the project’s feasibility and design plans. Rogers didn’t. “It takes us right back down the rabbit hole,” he said. He expressed concern with reducing the price by using cheaper materials. “I felt and still feel that’s the wrong way to go,” he said. McAndrews said afterward that it was a generous offer from Marks and Turowski that wouldn’t prolong the process too long. A broader consensus is needed, Rogers said during the meeting. That’s something that Loberg also touched on, saying the 50/50 split in town illustrated the divide. “It’s not a good enough consensus to move forward,” she said, adding that it’s time to work on a project that can win enthusiastic support. “If the vote had been the other way, we wouldn’t be sitting here and seeking a revote,” Loberg said. Tisbury School Principal John Custer, who was also in the audience, said he’s hopeful the town can come together at some point to find a project that can be supported by the majority. He said he would be open to renovations of the existing school, something that had become a dividing line for some who didn’t think that option got enough review by the building committee. The MSBA would have paid $14.1 million of the $46.6 million project. The town’s contribution of $32 million would have added an estimated $108 per $100,000 valuation for taxpayers. Once the town decides on what project it will seek, it will have to reapply to the MSBA for potential state funding. School officials have said the earliest the town can apply is next April for a January 2020 decision. Tristan & Jimmy, Just one more select~person to replace and we will have a board that thinks like the silent majority here in VH. The ballot box sure showed that! Reminds me of our last Federal election. The silent majority in force, won by a total shocking landslide and the losers still cant get over the results. They were so convinced they had it in the bag. The new guys at the MV Times are not going to make you jobs any easier since you both stand by the No Vote! So many that surround us over the past 15+ years have really changed our town and the Vineyard in a not so pleasant way. Plus with their censor policies you wont see many of your supporters comments and thanks for sticking to you positions!. …a “silent” majority that does nothing but complains about everything and anyone around them that doesn’t agree with their fact-less stump speech. …a “silent” majority that proclaims a love of freedom yet threatens those who choose to live any lifestyle they disagree with. …a “silent” majority that has been oppressed by the very people they seek to elect for generations, yet rails against those who are worse off than them. Have you considered a career in public office? We need to get Israel and Loberg OUT. Those charlatans believe they are omnipotent but are in for a rude awakening when they are up for re-election. Tisbury needs to be supported by a representative who is pro education and social justice. These 3 egomaniacal hoaxes did not even consider proposals put forth today to save more money on this project. In a 5 minute meeting they gutted a 5 year project like a fish. What a monumental waste. Meanwhile our kids attend a school that is literally crumbling. Loberg, Israel and Robinson will leave quite a legacy; saving the taxpayers a few bucks while endangering the lives of the children in this community. Pro education Mr Finnegan does not include a 46mm building that the town can not afford and social justice has nothing to do with education.”endangering the lives of children”? Hyperbole maybe? ”egomaniacal hoaxes”. Could you argue on the merits please? These representatives put the taxpayer first. the last guys didnt depreciate the school and prepare for a replacement cost. PS… See I got this message ==>> Your comment is awaiting moderation…. PS– See I got this message ==>> Your comment is awaiting moderation…. tisbury native– First, every comment on this forum says “your comment is awaiting moderation” until it is cleared by the times– that keeps people on both sides from using profanity, seriously offensive statements, and filtering out really offensive stuff- just the fact that you think you are targeted is offensive enough– and it shows your ignorance as to how this forum works. trump won– ok– i accept that. i am over it. “Your comment is awaiting moderation” do you feel better knowing that the MVtimes censors everyone ? I never reply to your comments and wont start now. 2649 counties for Trump and 503 for Clinton. I would call that a landslide. The popular vote is a red herring and you know it. We dont elect on popular vote and if we did candidates would run on a completly different strategy. tisbury native– thank you for replying to my comment. I can see why you like trump. — never a word you can rely on. 46 th out of 58 elections is not a “landslide”. You can spin some facts ( I checked– at least you are citing facts and not just making things up– thank you) to show your side. but if you criticize me for stating he lost the popular vote and that doesn’t matter, but somehow think since he won an overwhelming number of back woods and gerrymandered counties that somehow constitutes a “landslide”. He did not win by a landslide in the vote that counts– Trump supporters should quit using that lie — it reduces their credibility. So let me get this straight, the same three selectman who voted unanimously to kill the new school project due to cost just unanimously approved a $5.2 million project to beautify Owen Park?!?!?!?!?!?! Tisbury voters if you are not outraged you are not paying attention. Where are your priorities? If the town already spent $825,000 on ‘the project’s feasibility and design plans” and just now the planner and architect want to start looking to find savings of 5-10% ? If savings are available how are they not already identified and commented on? 2-4 million in savings probably wouldn’t buy the votes necessary for approval but in small town dollars (in anyone dollars really…) thats a big number to brush off.